CONNECT's 4th General Assembly was held at the NXP premises in Hamburg, Germany. During the meeting, the good progress of the project was recognized, while the first prototypes and demos were presented! 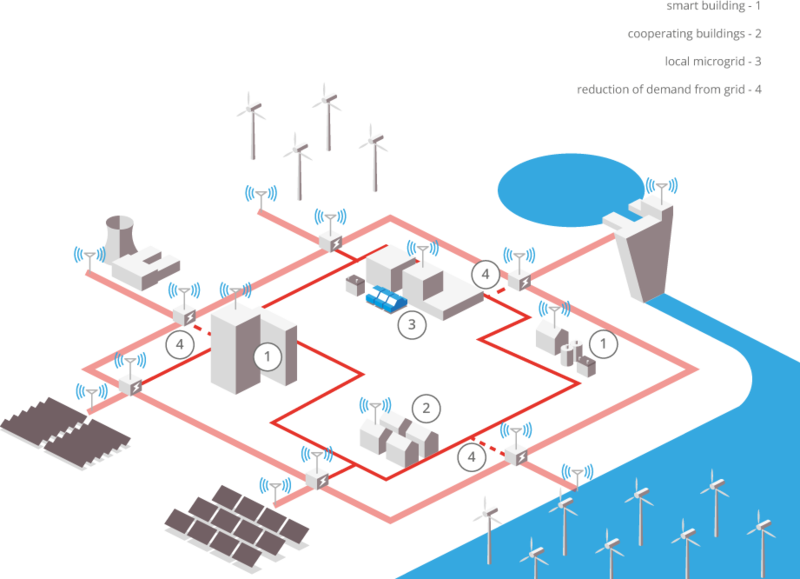 CONNECT investigates new concepts and technologies for power conversion that will be specifically developed for bidirectional power exchange with the grid and thus supports the extended integration of local storage and renewables such as PV. High efficiency, low-cost, low-weight, and compact high-power density converters with embedded communication capabilities will be developed for different application levels of the grid. Power quality optimization will be explored in order to avoid unnecessary energy flows in the grid. Objective A1: to design DC-Dc and AC-DC power converters with improved efficiency and reduced power consumption. Objective A2: to develop converters that optimally control and coordinate the reactive power output of inverter-interfaced distributed generators and distributed storage units. Objective B1: to reduce the power demand by providing consumption/generation data to the users, by developing advanced smart metering and sensing approaches. Objective B2: to reduce the peak demand through efficient energy management schemes that target to achieve optimal load scheduling through building cooperation, and through DC micro-grids. Objective C1: to increase smart grid current measurement performance, by developing high-efficient and low-power consumption sensors. 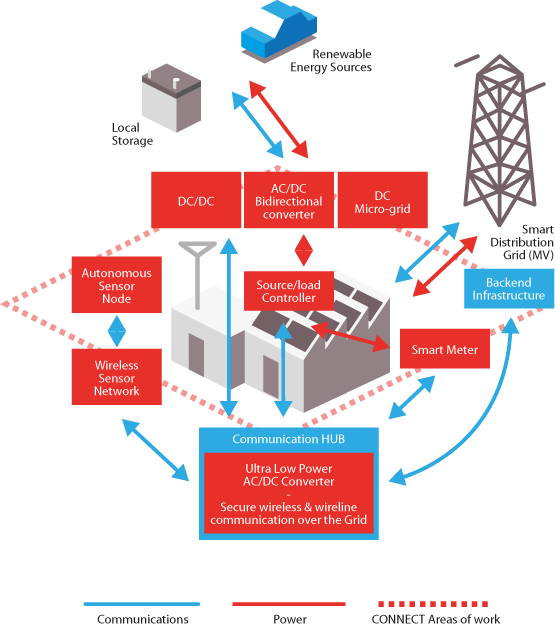 Objective C2: to increase the performance of smart grid communications by developing zero-power stand-by consumption wakeup receivers and high data rate power-line communications. Objective C3: to introduce advanced security measures for smart grid communications with advanced hardware- and software-based features. CONNECT’s objective will be also implement key test-bed modules/components that will be integratded as an outcome of the proof-of-concept phase to demonstrate teh ability of the smart grid insfrastructure to significantly reduce the peak demands. The structure of the project has been split into 5 complementary and well-balanced technical Work Packages (WPs). 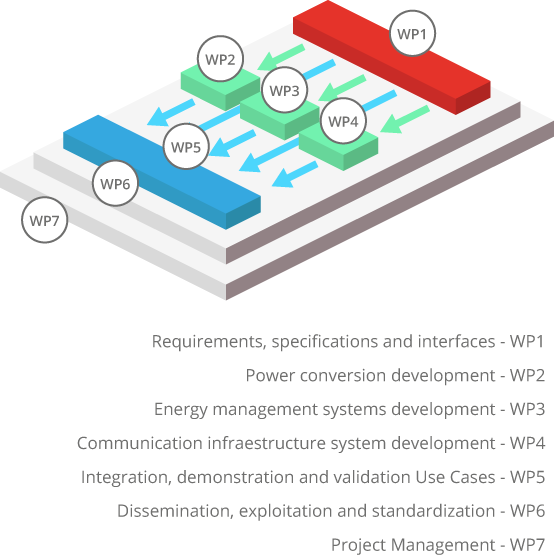 Furthermore, two WPs are defined for the dissemination, exploitation, and standardization of the results, as well as for the project management. The high-expertise of the WP leaders will guarantee the cooperation and the interoperability of the work of the participants. The project consists of 19 partners from 5 countries of the European Union. 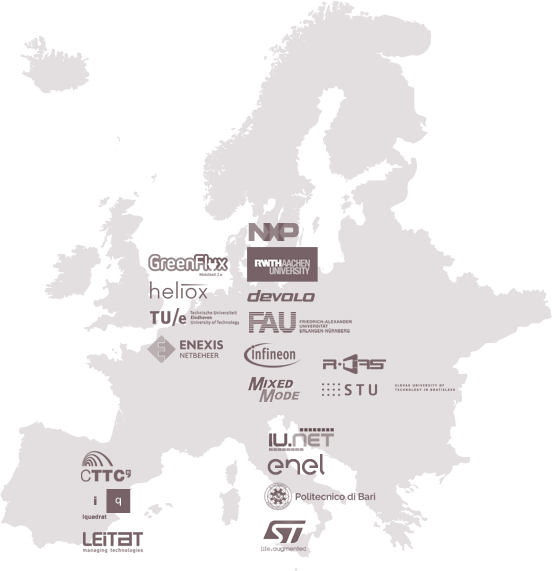 It is very well balanced in terms of research – industry collaboration as the consortium comprises 8 universities/research institutes and 11 industry partners, therein 6 SMEs.